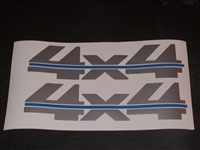 LARGE 4x4 # 2 Two Color (Silver w/ Red Stripe)Bed Decal 4" X 17"
LARGE 4x4 # 2 Two Color (Silver w/ Blue Stripe)Bed Decal 4" X 17"
will fit all year dodge ram! features a smooth, ultra-glossy surface to produce life-like graphics. method of application is very simple and any mistakes are easy to fix. larger car or truck just email us for info fit on any Car, truck, Jr. Installation instructions! Super fast shipping! We ship 6 days a week!